Because of the diminished long-terms returns-on-invested-capital and the inability for many commodity companies to build what Mr. Buffett and Morningstar call the “sustainable moat”, clients have never owned substantial positions in commodity companies for longer periods of time. Yes, Alcoa (AA) and Freeport (FCX) have been owned as well as Energy (post Q1 ’16) but ive found the sector (Basic Materials) and the asset class (commodities in general) to be tough investments in general, particularly today when – in the last 20 years – we’ve seen longer-term bear markets and now reasonable valuations in Technology, Financials, Retail and yes even Energy. Is crude oil in a new bull market ? The Friday, June 22nd, 2018, OPEC meeting looms large. In a recent Stratfor piece written in April ’18 when crude oil jumped from the low $50’s to the low $70’s, Stratfor asked the same question. Blaine Rollins, CFA of 361Capital writes a great weekly blog that comes out every Monday night, that is chock full of useful information for investors. I think Blaine was using a chart from John Roque, the great technician that called the top in the Nasdaq in early 2000, after John noted that the Nasdaq’s standard deviation was 2.5x above its long-term moving average. 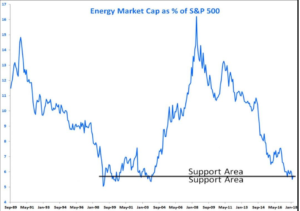 This chart actually makes a good case for the the crude oil / Energy sector bulls. Personally, i’m still agnostic to long-term negative on crude oil and Energy despite global growth, since i suspect some of the recent renewed interest in crude oil and the higher prices is due to the Saudi’s interest in maximizing value around the Saudi Aramco IPO (whenever that happens, possibly in early 2019). Here is what Stratfor had to say about this topic from their April ’18 article, “Has the Bull Oil Market Returned” ? “The bull market’s appearance is not driven by just one factor, indicating that perhaps reasonably high oil prices (that is, about $65 a barrel) are here to stay. Saudi Arabia’s tone here is critical. Recently leaked financial statements of the Saudi Arabian Oil Co. (Saudi Aramco) show why Saudi Arabia has been aggressively pushing for higher oil prices even while some oil producers, like Iran and Iraq, have been skeptical of its moves. Saudi Aramco’s financial figures showed that it was the most profitable company in the world for the first half of 2017: It earned a profit of $33.8 billion for the period, beating Apple by nearly $5 billion. The leaked statements also showed that Saudi Aramco had virtually no debt and that its production costs per barrel were just a fraction — $4 a barrel — of its peers. But investors were left concerned. Despite the profit margins, on a per-barrel basis, the dividend Saudi Aramco would have paid out would have been smaller than its multinational oil company peers because of its high tax and royalty rates. This means a realistic valuation of Saudi Aramco may be around $1 trillion to $1.5 trillion. Other reasons to be skeptical about a long term rebound in crude oil is that 50% of the long-run demand for crude oil in the US is driven by gasoline distillation and with the continued trend towards electronic vehicles (EV’s) over the next 10 years, will gasoline demand slowly erode ? Ford Motor’s recent announcement that they were eliminating production of all midsize sedan’s and focusing on trucks might help long-term gasoline demand except more aluminum is being used in trucks to reduce the weight of light-duty and mainstream pick-up trucks, which continues to add to improving gas mileage. Conclusion: Friday’s OPEC meeting is big. Looking at the longer-term prospects of crude oil (lower demand from less gasoline demand, higher supply from fracking and a world awash in crude oil, maybe offset a little by synchronized global growth) I still think the fundamentals portend lower rather than higher crude oil prices over time. Volvo announced in 2017 that they were moving to an “all EV” car lineup within 5 years or by 2022. Core Capital, a commodity advisor that has built a nice business managing the commodity asset class for investors, came through Chicago in 2017 and presented to the CFA Chicago Vault Series, and made a good case for $65 – $70 crude oil, and they in fact turned out to be correct. Recent commodity weakness in grains and cattle / pork seem more related to China and the tariff tiff. 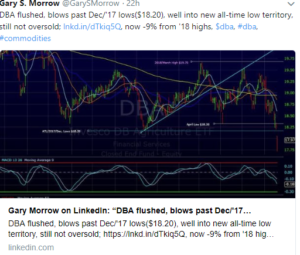 Gary Morrow, a great technician whose work is used on this blog frequently, noted the very weak DBA ETF (ag etf) yesterday. Per Morrow, this chart looks grim, but i suspect it could change if the China tariff issues get taken out of the headlines and get resolved sooner rather than later. The Energy bull / bear case will no doubt be discussed further in comments but commodities can be a very tough asset class in which to invest. My experience is that they are more trades than longer-term investments given lower capital returns and the rapidity with which conditions change. Personally, the Financial sector looks much better today given bank and finance valuations, the release of capital for dividends and stock buybacks coming over the next calendar year, and easing regulation.